I'm tickled pink that you like my blog, too. I've been a fan of yours for some time now. My name is a a bit confusing, I realize: you had it with "Mc" the first time, which it does not have; also, 'he' (me) is a she! 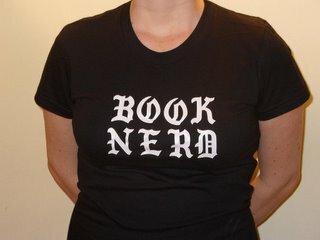 Yes, I'm a bookwoman! I do want to encourage you to follow your dream, though. It's not an easy life, but I wouldn't trade it for anything. Thanks again for visiting Books in Northport. Ha! Sorry for the confusion, P.J. -- I've corrected your name now. (I think I was confusing you with the author Patrick McGrath... hence my assumption of maleness.) Thanks for reading, and glad you like it -- what a mutual admiration society! I've been hooked on the bookseller blogs too and I don't even own a store! Such a dream of mine to be surrounded by books all day. So I just buy from you guys and stack them all around me - the next best thing!